HAIKU, the traditional knife-line by Chroma Cutlery, Inc. In Japan, the art of the sword smith has a long tradition. Today HAIKU knives are manufactured in small Japanese knife factories out of high-grade modern steel. Borrowing from an ancient method, a bamboo peg (“mekugi”) is inserted from the side into every HAIKU knife where the tang and handle are joined for added stability. To this day, traditional sword smiths in Japan use this time-tested technique when crafting swords like those once used by the samurai of medieval Japan. HAIKU – the Japanese knife with the honoki-wood handle. Often Imitated – Only Authentic with the Falcon. Never wash HAIKU knives in the dishwasher, the aggressive detergents and heat damage the steel and the honoki wood. Please wash the knife in warm water and dry it by hand after every use. Such care insures life-long reliability of HAIKU. Please do not cut bone or another hard materials with our HAIKU knives. HAIKU knives stay sharp a long time, but depending on how often you use the knives, they will need to be sharpened at home. 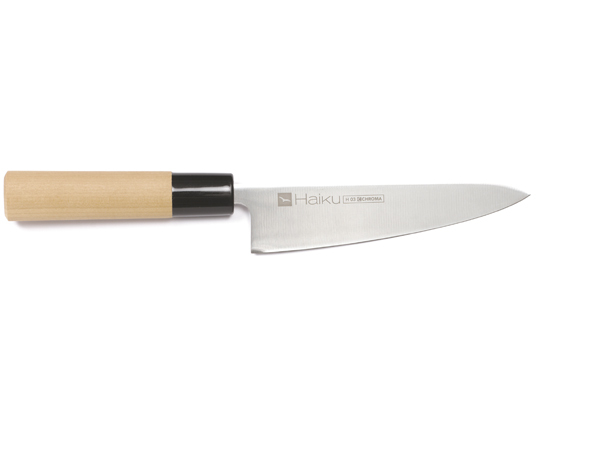 Japanese HAIKU knives are designed for quick and easy sharpening. Use the HAIKU whetstone for best results. There are many knives made in Asia that look similar to HAIKU, but you can feel the difference when sharpening or cutting with a true HAIKU, the only knife to have, like a hand-crafted Japanese sword. Thank you for reading this important information.